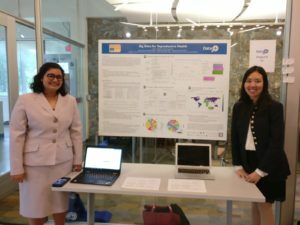 Saumya Sao (T ’20, Gender, Feminist and Sexuality; Global Health) and Melanie Lai Wei (Masters’ Candidate, Statistical Science) were proud to share the results of their 10-week Data+ project, Big Data for Reproductive Health, or BD4RH. The pair was just one of 25 teams that spent the summer using data-driven approaches to solve interdisciplinary challenges. The BD4RH team, led by Amy Finnegan and Megan Huchko, sought to build a web-based application that will allow users to visualize and analyze contraceptive calendar data from the DHS. To ground their project, they did a mapping exercise to identify currently available tools, identifying core elements they liked and key areas a new tool could improve. Using this data, and user feedback from various stakeholders in the field, they created a website that hosts four different data visualization methods to interpret trends in contraceptive use from the DHS contraceptive calendar. The site currently uses Kenya data to demonstrate efficacy, but datasets will be added soon. Although Wei had worked on coding projects in the past, Sao came into the summer with very little coding experience. She enjoyed learning how to work with R, and both students look forward to continuing the project through a Bass Connections team. The Bass team will continue to improve the website, gain a deeper understanding of machine learning and big data analytics, and engage with key stakeholders to ensure maximal usability for the tool.